[Jānis]’s entry for the Flashing Light Prize was doomed from the start. Or should we say Doomed? It was a complicated mess of Rube-Goldbergery that essentially guaranteed that he’d have no time for making a proper video and submitting and entry. But it also ran Doom. Or at least ran on Doom. 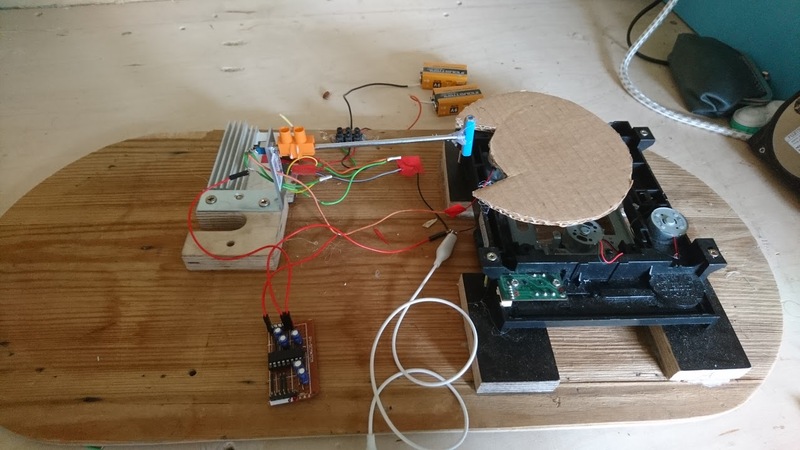 It starts with a DC motor salvaged from a DVD player that spins a wheel that flips a switch back and forth, which in turn flips the polarity of the power on the motor. It’s like a most-useless machine, but with no human involved. This contraption periodically presses a button on a gutted mouse. Pressing the mouse button on one computer fires a rocket in a multiplayer Doom game, and triggers a light on a wall when it does. A second Doom player, on another computer, sits facing the wall. Solar cells dangled in front of Player 2’s monitor emit high and low voltages as the LCD blinks on and off. That output goes into the ADC of an Arduino clone that drives a transistor that drives a relay that turns on and off a lightbulb. If you, like [Jānis] are still sitting on a design, don’t fret. It looks like the prize will make a return next year. Woot! The Flashing Light Prize is on right now, and that means all our favorite geeks and YouTubers are aspiring to what could be done with a 555. The rules are simple: turn a light bulb on and off somehow. [Sprite_tm] is answering the call, and he’s blinking lightbulbs at the speed of light. [Sprite]’s method of blinking a light is simple: Use an ESP32 development board to turn on a relay. At the same time, send a packet out to the Internet and through four servers spread across the globe. When the packet goes through servers in Shanghai, the Netherlands, to Hong Kong, to Germany, and finally Japan — and back again — the light bulb turns off. It’s a physical demonstration of the speed of light and the quality of undersea optical fibers. This route is quite long, and a reasonable estimate for the one-way, great circle path from Shanghai to the Netherlands to Hong Kong to Berlin and finally to somewhere near Osaka is about 36,000 km. A round trip for this light bulb packet is 72,000 km, or about 0.2 light-seconds. There are delays, of course, from fiber and cables not going directly over the Himalayas, delays in routers, and the difference between the speed of light in a vacuum and the speed of light in glass fiber. Still, light is quick, and the light blinks at about 1Hz. You can check out [Sprite]’s entry video for the Flashing Light Prize below.